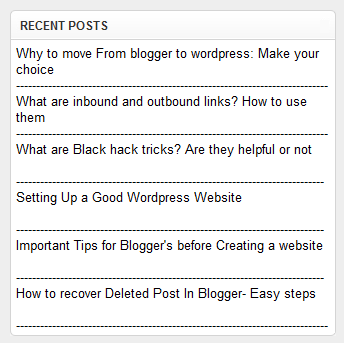 Are you looking for a simple and effective recent post widget for blog. Here I will providing you all with a simple recent post widget which you can customise on your own, as you want. This widget provides you with HTML code in which you can make changes on number of posts, display post title only, post excerpts or snippets as well are available, You can change number of character for post excerpts or snippets. Change 10 with the number of posts you want to display. Change false to true if you want the posts dates to appear. Change 100 if you want more characters to be displayed. Customise it and have fun 🙂 Thanks!! You can also visit my post for animated recent post widget.